Culinary Artists Vernell Lewis and Rosalind Tolson make Homemades by Suzanne worth repeating! Ever wonder while eating your sandwich from Homemades by Suzanne who makes the freshly baked rolls, or the vegetable soup or the deep dish pie or the award-winning brownies? It isVernell Lewis all the way from Caroline County. 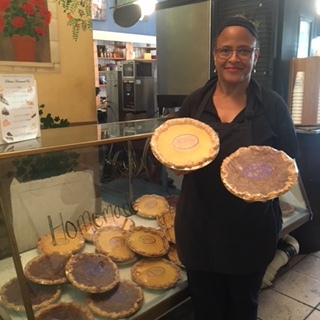 (Photo left) Vernell has worked at Homemades for 32 of the 34 years Homemades has been in business.. Not only is she a great cook, but she is loyal, trustworthy ,and kind. She is also a natural born story teller. Vernell is one of the store managers. She says if you use fresh and natural ingredients and think about the people who will be enjoying what you are making, then you know it’s going to be good. 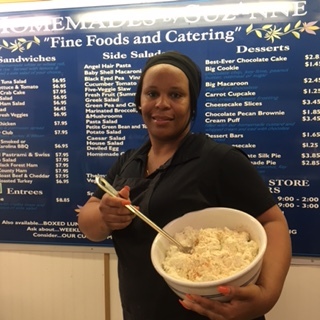 Many of our twice-a-year I-95 customers look forward to seeing Vernell when they stop in on their way to Florida or back to their homes in the North.Rosalind Tolson, a young grandmother, worked first at Homemades while a student at Patrick Henry High School. (Photo below right) She left to pursue other interests and raise a family, but now to the delight of all who work with her, she is back. Rosalind prepares the salads you see in the filled showcases at Homemades. .. the Chicken Salad, Tuna, Shrimp, Lobster, and many others. She is a very smart woman who can do anything and does it well. Her sister, Shelia, who heads up the John Marshall Restaurant and Ballrooms is one of Suzanne’s partners. Both of these delightful ladies, even with no formal culinary training, are deliciously talented and know what good food looks and tastes like. The Ashland community admires their talent every day! Homemades by Suzanne was founded by Suzanne and Warren Wolstenholme in 1982 in downtown Ashland. Suzanne credits the success of Homemades to long hours and hard work by an unusually dedicated and creative staff along with the blessing of loyal customers who recommend Homemades to their friends. Five-star reviews bring about customers from I-95 travelers who stop in for lunch on their way to or from Florida. Boxed Lunches are a large part of the business as are gift baskets filled with house-made foods. Full Service and Self-Service Catering is available. Homemades by Suzanne is special to the Ashland community! It is also the exclusive caterer in the beautifully restored historic John Marshall Ballrooms in downtown Richmond where weekday lunch is served in the Marshall Room at 5th & Franklin. To find out more about this special restaurant GEM – visit their website homemadesbysuzanne.com. Ashland Main Street is grateful to business owners like Suzanne Wolstenholme who bring repeat visitors to the Center of the Universe!